The siren output signal from a FingerTec device is known as a dry contact and this basically means that the signal is not initially connected to a voltage source. It can also be referred to as a secondary set of contacts of a relay circuit, which does not make or break the primary current that is being controlled by the relay. Selected FingerTec devices that come with a siren include TA100C, AC100C, TimeLine 100 and other time attendance systems. Previous installations to connect a siren with a FingerTec device could only support DC12V sirens. Now, AC240V sirens, which emits a louder sound compared to the DC12V siren, can be used in the installation provided that the relay used to control a circuit between the FingerTec device and siren supports the appropriate voltage. A power supply, such as AdapTec Plus for example, is required and must also be compatible with the relay in order for the connection to be successful. 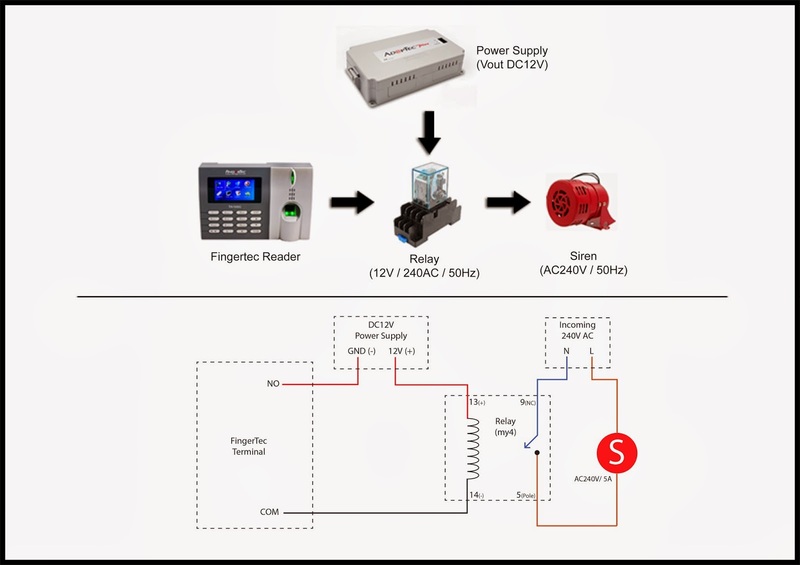 The following installation diagram will guide you on connecting a FingerTec device to an AC240V siren with the use of a relay board and power supply. With this in place, there is now an option provided for you to select the siren that suits your implementation better, be it a DC12V or AC240V siren. The AC100C really supports external sirens? if is possible, which are the terminals? For your information, yes the AC100C reader can support external siren. You can refer to the following link to get more details about AC100C terminal.